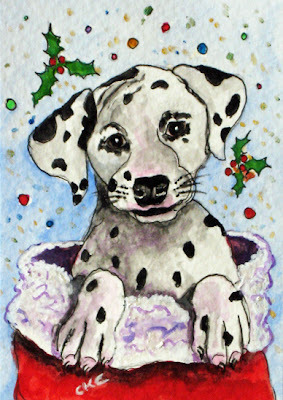 What a fun time I had painting this dalmatian puppy in a Christmas stocking. It's a festive time and puppies have such wonderful energy. Our neighbors have a corgi puppy, 'Oliver' that visits us and he is such a delight. I hope to paint a picture of Oliver soon too. Enjoy, this holiday season and don't forget to share gifts with your animal family members. What a wild week! Two power outages, living out in the forest on a bay at sea level becomes 'wild' when it snows and the winds pick up. Two 80+ foot Douglas fir trees came crashing down last night in the forest near our house. It was exciting. Power was out but my family was watching Happy Feet on my daughter's laptop by the roaring wood stove and candle light. Today the power was restored, so I'm working away to list a few items in our gallery. My love of turtles has been with me since childhood. I grew up in west Texas and after a spring rain - box turtles could be found walking out on the roads. My siblings and I rescued numerous turtles and we kept a few in our yard where they fed on cicadas, June bugs and prickly pear fruit. 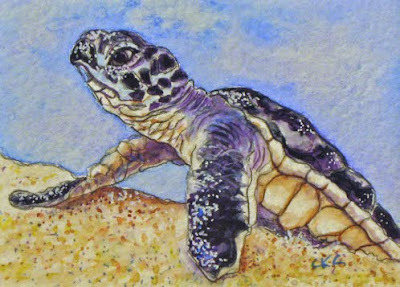 I worked with Kemp's Ridley sea turtles in Dallas during the mid 80's. Here is my newest painting celebrating 'sharing and traveling'. Sea turtles travel the world's oceans and the females return to the beach where they were born to lay their eggs. This ACEO has some silver and blue sparkling ink added (a touch of magic). It has been a month since I last updated my blog - shame on me. Here is a fun Art Card painted in watercolor and archival inks of one of my favorite marine mammals. "Breaching Majesty" was a wonderful miniature to create of our Pacific Northwest region complete with an orca and beautiful mountains on the horizon - all viewed from Puget Sound. 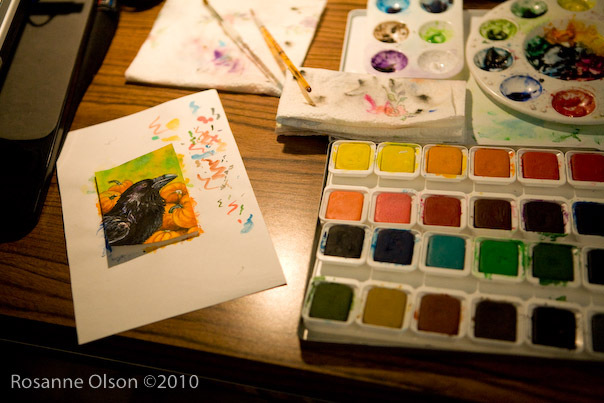 I never tire of painting, viewing, or learning about orca whales. They truly possess strength, power, intelligence and a nurturing nature for their young. Several pods have lived in Puget Sound for eons and they feed primarily on the resident salmon. It is always exciting to view them. 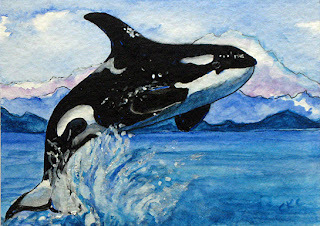 So enjoy this ACEO and may the power of the orca be with you! 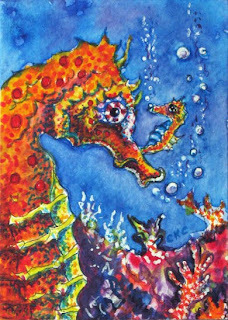 What a fun time I had creating this ACEO! 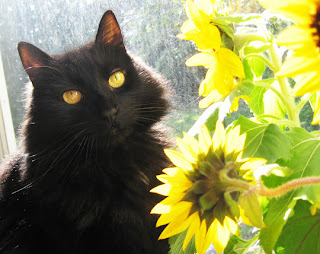 And the best part was that my kitty, Kraven (alias: The Bad Boy) was the model. It was great composing some of my favorite October subjects into one mini painting. 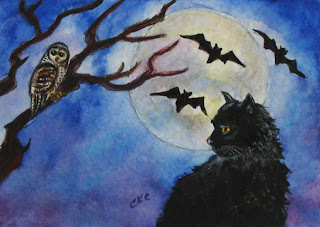 We hear owls often in the woods near our house and bats live in the open garage (the house was built in the late 1800's). The painting is complete with a full moon in a deep blue violet sky. Enjoy Moon Magic this October. Kraven enjoying a sunny location - he loves to smell flowers! This week I am working on 'marine moonlight miniatures' - how's that for an alliteration! 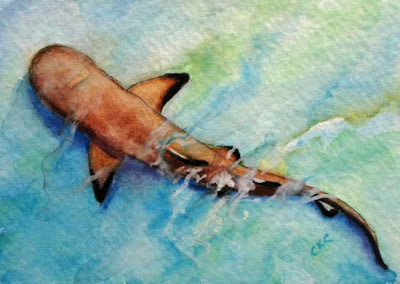 Here is a blacktip reef shark gliding in the moonlight. 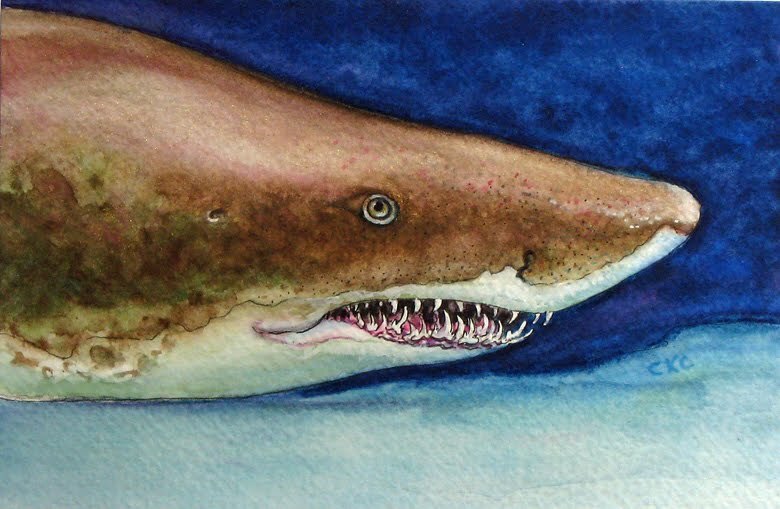 The distinctive markings on this species make it a wonderfully artistic subject. 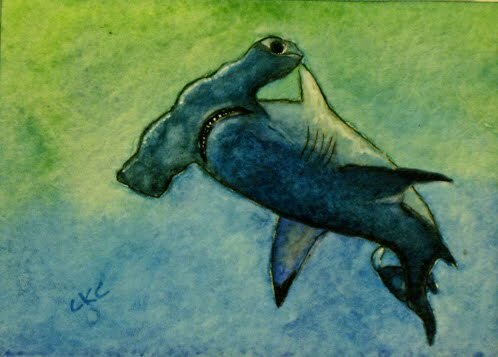 Blacktip Reef Shark "Moonlight Glide"
Here is an ACEO of a sea turtle swimming in the magic of the moonlight. This was a fun miniature to paint and I enjoyed creating the effect of the moonlight through the water. 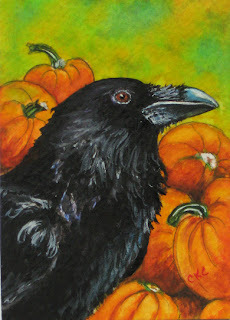 This weekend my daughter, Kathryn, is painting some lovely art cards. 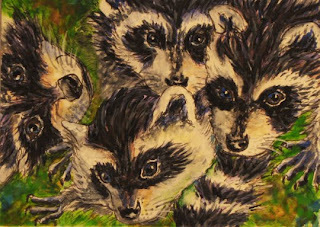 Here is one she completed of a family of raccoons. The mother is on the far left, curled around and the three babies are cuddling up to her. 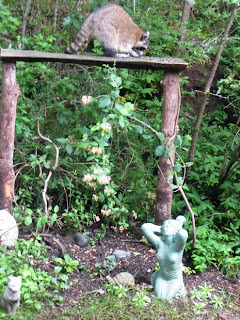 Raccoons are a favorite subject of ours and we have a resident raccoon that visits the garden often. 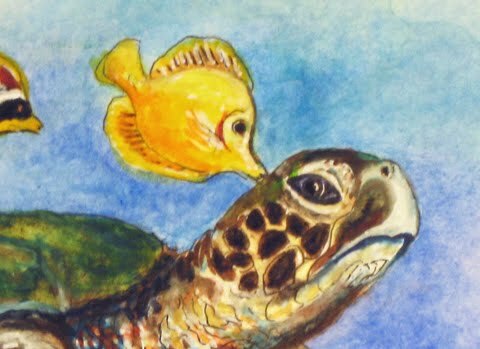 Here is an ACEO of a sea turtle and yellow tangs. 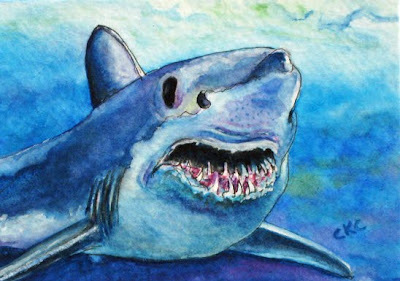 I love these wonderful marine reptiles and enjoyed working with Kemp's Ridley sea turtles in the mid 1980's. The yellow tangs are cleaning the turtle of algae growth that accumulates because of the slow movements of the turtle. The color of the tangs contrasts nicely with the deeper violets that I used to under paint the darker areas of the turtle. 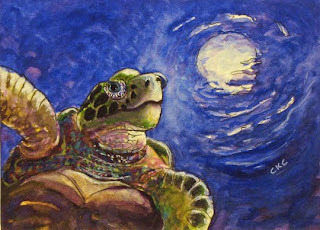 I also enjoyed painting the eyes of all the creatures - it really brings the focus to the eye of the turtle which holds much wisdom. In this time of 'cleaning up the BP oil spill', turtles are a focus for many biologists and volunteers. 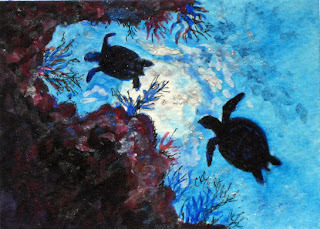 This painting is dedicated to the continuing efforts of those helping the turtles, other wildlife and the environment. 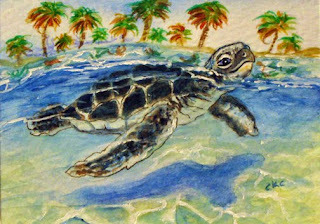 Sea Turtle "Entering Cleaning Station"
This week I have had a lot of fun researching sea turtles (one of my favorite marine creatures) and viewing numerous images of tropical fish to create a miniature painting. A little larger than my ACEO's - this painting is a 5.0" x 7.0". What a joy it was to design and paint. Sea turtles will seek out reefs where they enjoy a thorough 'cleaning' by the locals. The tropical fish and sometimes shrimp and crabs will consume the algae that grows on the turtles. Cleaning stations are a wonderful example of a symbiotic relationship where all the creatures benefit. 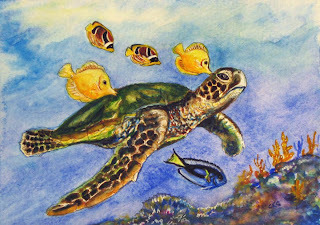 The tropicals in this painting include: yellow tangs, a blue tang and raccoon butterfly fish. Here is a very special painting created from my garden. This adorable raccoon has enjoyed a few meals of sunflowers recently at the feeder. I also included a goldfish like one that we have in a container pond near this area. 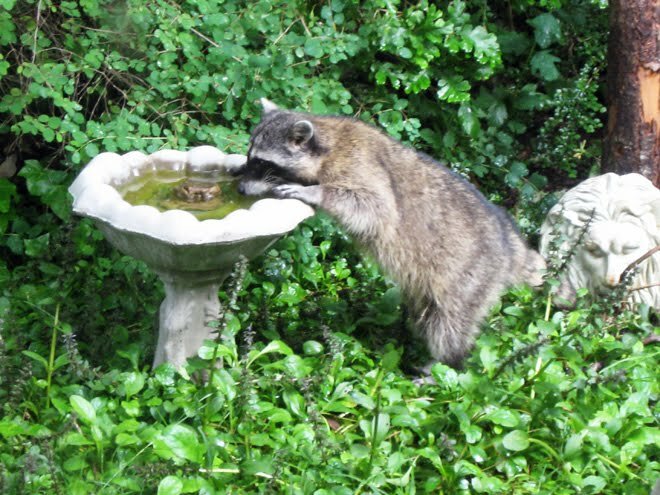 Don't worry - I don't keep goldfish in the birdbath. This is a small garden at the north side of our home and the kitchen window faces it. I enjoy washing dishes by hand while viewing the wildlife. I took photos of this 'rascal' feeding at about 10:00 a.m. one morning recently and have included a couple of them. 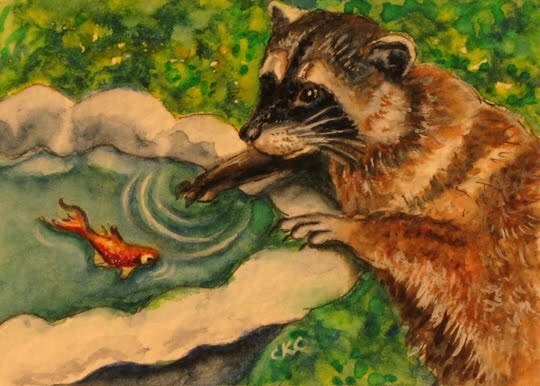 No animals were harmed in the making of this painting. 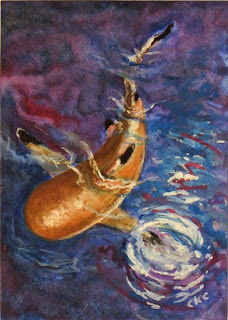 The fish ate this morning and it is still just as gold and beautiful as in the painting. This is a wonderful design for a bird feeder and can be built from natural logs. 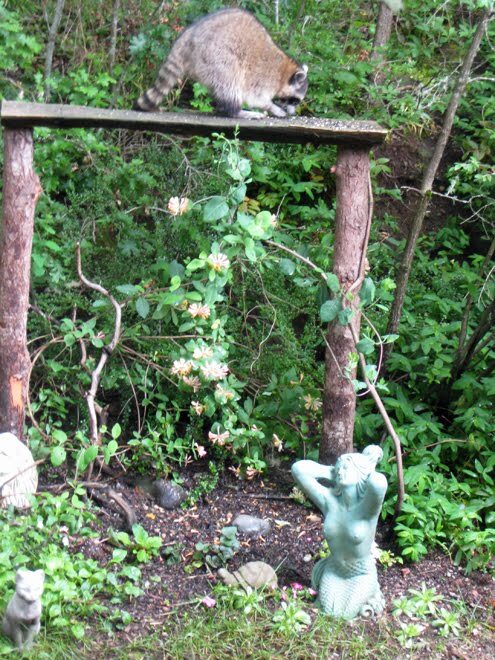 It allows numerous birds, squirrels and even this big raccoon to enjoy lots of seeds in this garden sanctuary. 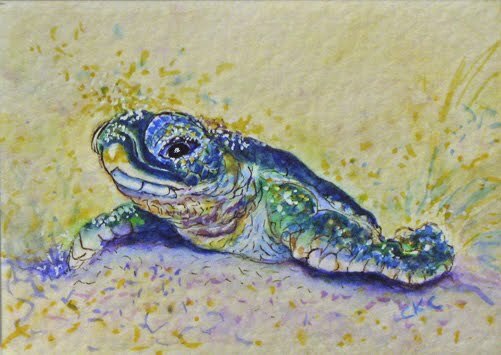 Baby Sea Turtle "Into the Sea"
Visit previous Post "Seaward Bound"
This is a special painting of a beautiful marine creature. I have enjoyed an interest in sharks for 35 years. Working with tropical species in a large aquarium setting for over a decade was a joy. Now, I thoroughly enjoy painting these magnificient animals. 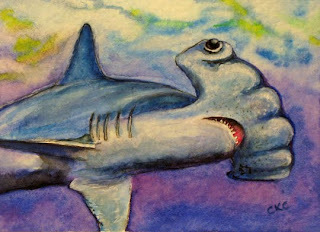 This painting is best described by my dearest friend, marine photographer, Jim McKay. 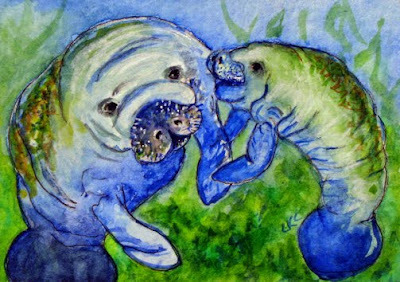 This week, I have enjoyed painting more marine mammals. 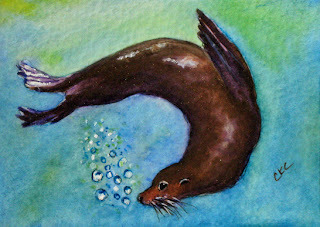 "Bubbles" is a sweet sea lion that I have featured in several paintings over the past two years. She is a young, fun loving, wild pinniped (suborder of carnivorous aquatic mammals that includes: seals, sea lions and walruses) and she loves to blow bubbles and play with them. 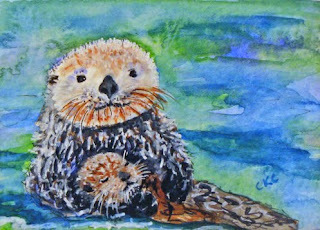 Sea Otters (Mother and Pup) "Sweet Moment"
Sea Otters have always been a favorite subject of mine to view and paint. These amazingly agile mustelids (heaviest members of the family including: weasels, river otters and minks) are so engaging. We have river otters on the bay near our home and their loud squeaks and whistles can be heard for quite a distance. In this painting, I am showing a sweet moment between mother and pup. 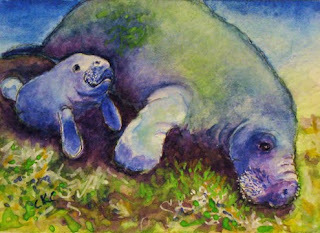 This week, I enjoyed painting another manatee minaiture. These lovely creatures have captured my heart and I hope to someday share a moment with them in their habitat. The colors I chose for this art card include: marine blues and greens with a fair concentration of violet for the shadows.